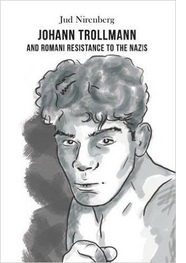 Jud Nirenberg is the author of Johann Trollmann and Romani Resistance to the Nazis. Nirenberg works at Control Risks, a global consultancy helping organizations manage political, integrity and security risks in complex and hostile environments and he serves as chairperson of the board of Macedonia’s National Roma Center. On May 16th, Roma across Europe observe Romani Resistance Day and remember that date in 1944 when “Gypsy” prisoners of Auschwitz-Birkenau rose up with stones, hand-made blades against guards with machine guns and repelled an attempt to liquidate Birkenau’s Gypsy Camp IIe. The prisoners largely survived until August 2nd, when the Nazi administration finally exterminated nearly all of the camp’s section. Roma community organizers today come together on May 16th not only to mark the uprising in one concentration camp but also to recognize a longer and ongoing history of struggle against mistreatment. Today Romaare the largest ethnic minority in Europe. Perhaps ten to twelve million Roma live in Europe if one counts all the people of the Romani diaspora, such as the Sinti. They are also, by many measures, the most marginalized. A Pew Center study in 2009 found that 84% of Czechs expressed a dislike of Roma, as did 78% of Slovaks, 69% of Hungarians and 84% of Italians. Across Europe, studies have found Roma are seen less favorably than Black, African, Muslim, Jewish or Gay people. Wired magazine noted in 2016 that the top two most hate speech terms used in Tweets from the UK are anti-Gypsy slang words. Anti-Gypsy bias is Europe’s and Britain’s most socially acceptable bigotry. Romani children are, in several countries, still mostly placed in segregated and inferior educational settings. In some countries, Roma are put in schools that are officially for the learning disabled, but predominantly populated by Roma. Even in many supposedly integrated schools, Roma are put in separate classrooms. Placed in learning environments where little teaching is done, Roma commonly drop out in their teenage years. Job discrimination is common even for those Roma who do have employable skills. While employment discrimination is illegal in most of Europe, enforcement of anti-discrimination laws is not easy. Uneducated, unemployed and disliked, Roma typically live in slums, apart from non-Roma. The bias does not stop at Europe’s borders. Richard John Neuhaus, editor of the well-reputed and widely read American publication First Things calls Gypsies “lazy, lying, thieving, and extraordinarily filthy people.” Otherwise intellectual people voice opinions of Roma that would be quickly rebuked as stupid bigotry if said about any other ethnic community. The current poverty and ghettoization of so many Roma is the result of a dark history. Discriminatory laws limited Roma’s economic freedoms and integration in countries across Europe for centuries. In the areas that are now Romania and Moldova, Roma were kept in slavery for five centuries, ending only shortly before emancipation of African Americans in the United States. In the 1940s, Germany had the collusion of Axis partners and even occupied peoples in the plan to cleanse Europe completely of Roma and Sinti genes. (The Sinti are a part of the Romani diaspora, smaller in numbers and found almost exclusively in and near Germany.) And behind the Iron Curtain until 1989, the rhetoric of ethnic equality was estranged from the real practices of governments that put Roma in segregated neighborhoods and treated them as inferior on the labor market. If current conditions are a result of centuries of abuse, few school textbooks even mention the Roma at all. Bulgaria and Romania are the two countries with the largest Romani communities; in Bulgaria, there is no mention in schools of the Romani genocide in WWII and no teacher training available on the subject. In Romania, there are no references to Romani history – neither Romania’s history of slavery nor the Holocaust – in the history books that are normally distributed to students in Romania. The Ministry of Education, in cooperation with UNICEF and a Romani non-profit called CRISS, have developed materials and lessons for teachers who choose to seek them out on their own initiative. Germany is the country where education about the history of the Roma and Sinti, including the Holocaust, is most extensive. With right-wing and even fascist politics now on the rise in some of the countries where the most Roma live, Romani leaders are reflecting on how civil rights efforts since the fall of the Iron Curtain when most Roma earned the right to organize and speak up – have achieved so little. Approaches to fighting public prejudice are being reconsidered. For some Roma, more discussion of history and a stronger effort to introduce the public to a side of Romani culture beyond the stereotypes of dance and performance art, are part of the answer.